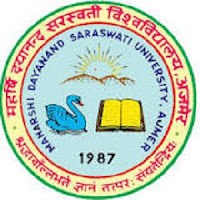 Maharshi Dayanand Saraswathi University (MDSU), Ajmer conducts Pre Teacher Eligibility Test (PTET) Examination every year. This Year the University conducted PTET Examination for B.A. B.Ed./B.Sc. B.Ed. candidates on 14th May 2017 , 2-5 pm. Maharshi Dayanand Saraswati University (MDSU) Ajmer is a prominent affiliating university in the state of Rajasthan. For an urge to boost quality in education, the University was accredited by NAAC in the year 2004 with B++ grade. On 1st June 2017 the PTET department released the Result of PTET Exam 2017.This PTET Result is declared by MDSU Board. All the Students who have applied and appeared for the PTET 2017 written examination can check their PTET Result, along with score cards, Marks list, cutoff marks, merit list name wise at the department website or by clicking on " Click Here to View Result" link given Below. 2).On the Home screen of PTET website you will see a link with the following text “ Result P.T.E.T - 2017”. Click on the Link. 3).After that a login Menu will appear on the screen. Just fill you Password, ID number and the other details to check your PTET Result 2017. 4).Then just click on the submit button, your PTET Result is infront of you.